From amateur and security camera footage to images shot by professional journalists, here is a look at some of the most incredible video of 2012 from around the world - - Reuters. Advanced economies could wing it through 2013, according to George Magnus, senior economic adviser to UBS, but there are some questions marks about the economic models of some of the world's fastest growing countries. He discusses the global prospects - and risks - for the year ahead with Ralph Atkins, the FT's capital markets editor. Firearm injury in the United States has averaged 32,300 deaths annually between 1980 and 2006. In 2006, Japan recorded 2 deaths related to guns. "In 2008, the US had over 12 thousand firearm-related homicides. All of Japan experienced only 11, fewer than were killed at the Aurora shooting alone. And that was a big year: 2006 saw an astounding two, and when that number jumped to 22 in 2007, it became a national scandal. By comparison, also in 2008, 587 Americans were killed just by guns that had discharged accidentally." 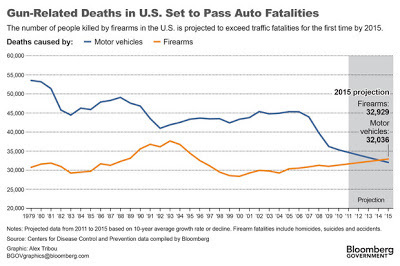 Bloomberg reported last week that while motor-vehicle deaths dropped 22% from 2005 to 2010, gun fatalities are rising again after a low point in 2000, according to the Atlanta-based Centers for Disease Control and Prevention. Shooting deaths in 2015 will probably rise to almost 33,000, and those related to autos will decline to about 32,000, based on the 10-year average trend. Gun deaths by homicide, suicide or accident peaked at 37,666 in 1993 before declining to a low of 28,393 in 2000, the data show. Since then the total has risen to 31,328 in 2010, an increase of 2,935, or eight more victims a day. Germany has a population of 82m compared with the US at 312m. The number of persons killed in traffic accidents in Germany is expected to fall by more than 7% to some 3,700 in 2012. This is suggested by estimates from Destatis, the federal statistics office, based on data available for the period from January to October 2012. As things stand, the figure will not be smaller than the lowest number of fatalities recorded to date, which is 3,648 persons killed in 2010. See chart of trend from 1953. The number of murders is the lowest since 1963, when improvements in the recording of data were made. Of the 414 murders, 14 deaths from previous years were counted as homicides for the first time. In many of these cases, victims of long-ago shootings died of sepsis in hospitals, the police said. Of the 400 murders in 2012, 223 were gunshot victims, 84 victims were stabbed to death, 43 died of blunt trauma and 11 died of asphyxiation. The majority of the 400 homicides occurred on a Saturday, followed by early Sunday morning. Most occurred at 2 am. People were more likely to be killed outside than in. Nearly 70% of the victims had prior criminal arrests, the police said. Domestic-related homicides dropped to 68, from 94 in 2011. "The number of murders this year will be lower than any time in recorded city history," Mayor Michael Bloomberg said, hailing the work of the New York Police Department (NYPD). "It also reflects our commitment to doing everything possible to stop gun violence," he said. "Murders are down almost 19% this year compared with last year. They are down 35% from where they were 11 years ago when our administration began," Bloomberg added. The number of shootings in the city also fell to a record low 1,353 this year, down 8.5% from last year, said Bloomberg. The previous low was 1,420 in 2009. "We're taking 8,000 weapons annually out of the hands of people we stop, 800 of them illegal handguns," Ray Kelly, the police commissioner, said in a statement. In the first part of "The Party's Over" (above), first broadcast in December 2011, Robert Peston, the BBC business editor, visits Shanghai, the fastest growing city in China and home to 23m people. Here, he meets some of the city's workers prepared to earn less than their UK counterparts to help fuel the Chinese economic boom. However, the woes of the West struggling with high debt, ageing populations and the end of the American Dream and its equivalent for other developed nations, will not mean that emerging economies face a long period of plain sailings. Headwinds are evident everywhere. The United States has an unexpected silver lining compared with just a short time ago. The United States will become increasingly energy independent in the next three decades as it boosts its production of oil, natural gas and renewable power such as solar and wind. Meanwhile, US crude oil production averaged almost 6.5m barrels per day in September 2012, the highest volume in nearly 15 years. The last time the United States produced 6.5m barrels per day or more of crude oil was in January 1998. Since September 2011, US production has increased by more than 900,000 barrels per day. Most of that increase is due to production from oil-bearing rocks with very low permeability through the use of horizontal drilling combined with hydraulic fracturing (fracking). The states with the largest increases are Texas and North Dakota. The US Energy Information Administration this month issued its Annual Energy Outlook 2013 (AEO2013), which highlights growth in total US energy production that exceeds growth in total US energy consumption through 2040. The BBC says that in the teeth of the worst financial crisis in living memory, Robert Peston examines how the world got to this point and how the colossal imbalances in the global economy have left the UK in need of a radical economic overhaul. In this first of two programmes Peston examines how, thirty years ago, momentous decisions were taken which shaped the world we live in today. In China, Deng Xiao Ping opened up the country to foreign capitalists; in Britain and America, the free market revolution was unleashed by Margaret Thatcher and Ronald Reagan. "The Party's Over" compares the lives of workers in a Chinese company with their co-workers in Britain. The demographic outlook for the BRICs (Brazil, Russia, India and China) varies greatly. The differences in the projected change in the working-age population are very significant in both absolute and relative terms. This will impact not only economic growth prospects, but also savings and investment behaviour and potentially financial market growth prospects. Brazil and India are demographically in a substantially more favourable position than China and Russia. With the exception of India, demographic developments in the BRICs are becoming, or will soon become, a net negative in terms of per-capita growth. The working-age population in India will increase by a stunning 240m (equivalent to four times the total population of the UK) over the next 20 years, compared with 10m in China. However in the big country league, only in Brazil, India, the UK and the US will the potential labour force be tangibly larger in 2030 than today. China should double its GDP (gross domestic product) by 2020 President Hu said in a speech at the opening of the Communist Party’s 18th congress last month. Hu who handed over the position of party general secretary to Vice President Xi Jinping a week later, also called for “deepened reform of the financial system” and more local-level democracy. China was ranked 121st in gross national per capita income for 2010 by the World Bank, at $4,260, close to Jordan and Thailand and less than 1/10 of the US’s $47,140. However, on a purchasing power parity (PPP - - The rate at which the currency of one country would have to be converted into that of another country to buy the same amount of goods and services in each country) basis during Hu's presidency, GDP per capita more than tripled from $2,800 in 2002 to a forecast $9,100 in 2012 according to the International Monetary Fund. ChinaRealTime, a Wall Street Journal blog, says that rising incomes pushed China into the middle-income bracket of emerging nations. With few signs of democratisation, China also defied expectations that rising wealth would lead to political reform. Ten years of rapid growth is an impressive record. But much of the credit must go to Hu’s predecessor Jiang Zemin, who shepherded far reaching reforms that laid the foundations of the decade’s growth. The boost from those reforms is now running its course. China’s entry into the World Trade Organisation in 2001 ushered in an export boom, with exports averaging nearly 30% annual growth from 2002-07. But as China has grown to be the world’s largest exporter, with more than 10% of the global market, the room for further expansion is limited. Rising wages, and a stronger yuan, have also taken a toll on export competitiveness. Ruchir Sharma, head of emerging market equities and global macro at Morgan Stanley Investment Management, which has about $25bn in emerging market assets, and is the biggest investment rival of Goldman Sach's, says in a recent issue of 'Foreign Affairs,' that the recent slowdown in growth in emerging economies should not be surprising, because it is hard to sustain rapid growth for more than a decade. The unusual circumstances of the last decade made it look easy: coming off the crisis-ridden 1990s and fueled by a global flood of easy money, the emerging markets took off in a mass upward swing that made virtually every economy a winner. By 2007, when only three countries in the world suffered negative growth, recessions had all but disappeared from the international scene. But now, there is a lot less foreign money flowing into emerging markets. The global economy is returning to its normal state of churn, with many laggards and just a few winners rising in unexpected places. The implications of this shift are striking, because economic momentum is power, and thus the flow of money to rising stars will reshape the global balance of power. Sharma who is the author of the book, 'Breakout Nations: In Pursuit of the Next Economic Miracles,' says that the notion of wide-ranging convergence between the developing and the developed worlds is a myth. Of the roughly 180 countries in the world tracked by the International Monetary Fund, only 35 are developed. The markets of the rest are emerging-and most of them have been emerging for many decades and will continue to do so for many more. He says that Dani Rodrik, the Harvard economist captures this reality well. He has shown that before 2000, the performance of the emerging markets as a whole did not converge with that of the developed world at all. In fact, the per capita income gap between the advanced and the developing economies steadily widened from 1950 until 2000. There were a few pockets of countries that did catch up with the West, but they were limited to oil states in the Gulf, the nations of southern Europe after World War II, and the economic "tigers" of East Asia. It was only after 2000 that the emerging markets as a whole started to catch up; nevertheless, as of 2011, the difference in per capita incomes between the rich and the developing nations was back to where it was in the 1950s. I call this illusion commodity.com, for it is strikingly similar in some ways to the mania for technology stocks that gripped the world in the late 1990s. At the height of the dotcom era, tech stocks comprised 30% of all the money invested in global markets. When the bubble finally burst, commodity stocks -- energy and materials -- rose to replace tech stocks as the investment of choice, and by early 2011 they accounted for 30% of the global stock markets. No bubble is a good bubble, and all leave some level of misery in their wakes. But the commodity.com era has had a larger and more negative impact on the global economy than the tech boom did. It is well-justified unrest. If anything, the negative impact of sky-high commodity prices on the larger economy is underestimated. The price of oil rose sharply before ten of the eleven postwar recessions in the United States, including a spike of nearly 60% in the twelve months before the Great Recession of 2008 and more than 60% before the economy lost momentum in mid-2011. When the price of oil trips up the United States, it takes emerging markets down with it. In 2008 and 2009 the average economic growth rate dropped by 8%age points in both the developed and the emerging world, from its peak pace to the recession trough. Herbert Hoover, US president (1929-1933), came up with the term ‘depression’ because it was more soothing than panic or bust. The term ‘austerity’ wasn’t promoted by a marketing type. Whether right or wrong, Gene Kerrigan writing on the Irish crisis has more credibility than for example Shane Ross. There is the European dimension but also the local one where for example in Ireland, the people without countervailing vested interest power are unfairly targeted. So after a 20-year credit binge, credible alternatives to some form of fiscal adjustment in Europe, are seldom aired. In Ireland, those who are the victims of the crash are seldom heard from. Excluding the property boom, there was no growth in Ireland in the past decade. However, bubbletime gains and pensions are still available in the public sector. The British Empire's guarantee of employment in the civil service which dates from that 1850s continues to exist in the Irish civil service alongside premium pay and pension benefits. Meanwhile, Labour Party TDs hypocritically protest against welfare cuts, while senior civil servants can get retirement bonanzas worth several million euros. The Federal Reserve has been the most active central bank among developed countries but last month, the broad measure of US unemployment was 14.4%, down from 15% in Nov 2011. Nevada, like Ireland had a big housing bust, and its rate is 21%. Banks have done well from the low central bank lending rates. Mario Draghi, ECB president, does deserve credit for stabilising the euro. Europe’s 3 biggest economies, Germany, France and the UK, are projected by the IMF to have gross debt to GDP ratios of 81.5%, 92.1% and 93.3% in 2013. What level of stimulus would be required to return the continent to 2007 growth? The first part of the quote isn’t true; the second part is but if he really understood the Irish economy, he wouldn’t be quoting PMI data. Estonia is projected to grow by 2.1% this year and 3.1% in 2013 — this is another small economy where headline data is misleading. Some 20% of Estonia’s 2012 budget comprises EU transfers, which will start running out in 2015. As regards exports, a small number of firms are part of European supply chains while re-exports are also significant (goods imported via Estonia by Russian firms, from third countries). Barcelona and Argentina forward Lionel Messi has broken Gerd Müller's 40-year record of 85 league and international goals in a calendar year. WSJ's Joshua Robinson has been keeping tabs. From Bengal tigers to unproven actors, Ang Lee's "Life of Pi" pushes the limits of book-to-film adaptations. WSJ Off Duty talks to one of the stars, actor Irrfan Khan, and takes a look back at famous animals in movies. Plus, WSJ Film Critic, Joe Morgenstern, reveals his picks for most "inspired" and "idiotic" film adaptations. With host Wendy Bounds. Ireland Unemployment: 188,000 were unemployed continuously for 12 months or more in Oct 2012. As regards the lack of part time data on public sector staff, it maybe be a state secret to avoid a focus on full time equivalent numbers — down 5,406 since 2007 - - which looks less impressive than the claimed reduction in numbers. Wonder how many former staff have been given nixers as consultants? The Irish Times reported on Saturday on the bonanza for the former head of Aer Rianta International, the DDA (Dublin Airport Authority) unit. “exit package comprised a lump sum of €437,000 and a payment of €68,000 annually for 6.3 years to bridge the gap to retirement. The DAA confirmed yesterday that Mr Foley now worked as a paid external consultant with ARI and served on the boards of certain subsidiaries. People who want to retire should be left go with no strings attached. Have your cake and eat it elsewhere! The country is banjaxed! “The graveyards are full of indispensable men,” is a quote attributed to General Charles De Gaulle. When Samuel J. Palmisano retires next month, he’ll enjoy a generous goodbye present: The former IBM chief will earn $20,000 for any day he spends four hours advising his longtime employer. That means hypothetically he could pocket $400,000 a year for 20 half-days of work—twice what his predecessor, Louis V. Gerstner Jr., makes per day under a similar consulting arrangement. Mr. Palmisano’s contract is open-ended and doesn’t specify the number of days he will work. Mr. Gerstner’s 10-year consulting contract expires in March. This is simply a shakedown for the super-rich. As regards the Irish self-employed, many are freelancers, not by choice and of course, they lack political clout. Average annual earnings fell to €35,905 in 2011 from €36,117 in 2010, a decrease of 0.6%. This compares with a revised fall of 1.9% between 2010 and 2009, according to the Central Statistics Office. In 2001 the Exchequer net pay and pensions bill (ex local authorities) was €10.2bn; it was €16.2bn in 2006 (the peak year of the bubble); €17.6bn in 2007; €18.7 in 2008 and is estimated to be €16.9bn in 2012. These figures are net of pension contributions (normal and emergency). So to compare with 2007 when it was clear to those of us who weren’t afflicted with Walter Mitty syndrome, that the game was up, there is a saving of €700m. However, we don’t know how much the current cost of the €1.5bn in allowances has risen in the period. Let’s say €300m. That leaves €400m and then just note that in 2009, the State assumed direct responsibility (a bail-in or bail-out?) for the Trinity College pensions’ deficit of €315m! The pay and pensions bill takes 42% of net current spending of €40.5bn which has risen by €3.5bn since 2007. It’s one of several issues of importance in seeking to develop a sustainable economy. I do cover the others as well! I have yet to see a justification for the continuation in modern times, of the 1850s era British Empire guarantee of employment. Among EU Member States, in 2010 the mean (average) gross annual earnings of full-time employees in enterprises employing ten employees or more were highest in Denmark (€58 840), followed by Luxembourg (€49 316), the Netherlands (€45 215), Ireland (€45 207, in 2009), Belgium (€43 423) and Germany (€ 42 400). On the other hand, the lowest mean gross annual earnings were registered in Romania (€5,891) and Bulgaria (€4,396) – see Table 1. Irish Economy: Sir Mervyn King, governor of the Bank of England, gave a speech last night in which he said: "Such is the scale of the global adjustment required that the generation we hope to inspire may live under its shadow for a long time to come." Many look to Brussels, Frankfurt or Berlin for solutions and the 'more qualified' (as used by a contributor on another thread or what David Begg might term 'people of standing' - - Jim Larkin had a point: "The great are only great because the rest of us are on our knees") tend to eschew radical solutions for what is under our control, while young people are targeted to bear the adjustments. The recent report on food deprivation highlighted an issue I alluded to yesterday. Ireland does not have the English allotment tradition and what is striking are the current very high subsidies for farming for even watching the grass grow, which has resulted in a big change from the 1970s when most farmers grew vegetables. Ireland produces 5% of the Dutch output of potatoes. Today, staples are likely to be imported and pricy while the tradition of the country cousins bringing produce to their urban relatives no longer applies. On a bigger scale, the fact that 5% of Americans are responsible for almost 40% of consumer outlays (including consumer spending, interest payments on installment debt and transfer payments) while the bottom 80% by income account for another 40%, shows the level of dependence on a small number in an economy where consumer spending accounts for almost 70% of GDP. In his 1776 book, 'An Inquiry into the Nature and Causes of the Wealth of Nations,' Adam Smith, a social democrat of his times, noted: "No society can surely be flourishing and happy, of which the far greater part of the members are poor and miserable." It's strange that a plutocrat has an excellent chance of becoming the next president. The heartland used be radical and the death this week of George McGovern, former US senator of South Dakota, highlights this change which Thomas Frank discussed in his 2004 book, 'What's the Matter with Kansas?' - - why relatively poor folk vote against their economic interests. "While taxation receipts in 2012 are projected to be just above 2004 levels, the gross voted expenditure of Government Departments and Offices in 2012, at an estimated €56 billon, is projected to be 37% above the level it was in 2004, despite the very significant adjustments to both revenues and expenditure since mid-2008. While the gap between the State’s revenues and expenditure is clearly on a downward trajectory, it remains at an elevated level and it will need to continue to be addressed by economic and fiscal policy over the coming years." The foregoing is a contribution to a thread on the Irish economy blog. Colm McCarthy, UCD economist, wrote in The Sunday Independent yesterday: "Spare a thought for Clare County Council. On Monday, it emerged that the council was seeking confirmation that the €100 household charge had been paid by families seeking student maintenance grants. Yet the council was roundly denounced by several TDs for checking whether the €100 due from each household had been paid. It is truly remarkable that politicians, including representatives of supposedly progressive political parties, can countenance the sheer chutzpah of applying for a €3,025 grant while dodging a €100 charge that is legally due." 1. The argument about the impact that cuts in public spending could have on consumer spending is self-serving as is the one trotted out about a payoff for industrial peace. Read the Croke Park implementation body’s claimed ’savings’ from bubble levels while the Minister for the Status Quo gets away with stressing pay savings while ignoring rising pension costs. 2. At the Fianna Fáil Ard-Fheis in 1970, Seán Flanagan (1922 – 1993), minister for lands, who was captain of the Mayo All-Ireland football winning teams in 1950 and 1951, did a rare thing in Irish politics. He called publicly for his department to be abolished. Irish long-term unemployment - - at least a year or more — is at 60% of the total. Along with Slovakia, this is among the highest rates of the 34 mainly developed member countries of the OECD. The OECD said the authorities should set up mechanisms to systematically evaluate teachers’ and schools’ performance, and make the results public when adjusted for social-economic background. It added evaluation results should have implications for career progression, and inform any needed corrective action in relevant areas - notably extra teacher training at primary and secondary level, especially in maths. 3. Sweden and Finland reformed when they had to. In conservative Ireland, the tide will have to rise higher to imperil the thresholds of the comfortable. Ireland: How long will economic turmoil last? Eamon Gilmore, Ireland's Tánaiste (deputy prime minister) this week told an international audience via CNBC, that Ireland has emerged successfully from the EU-IMF bailout because it faced up to the crisis including making quick decisions on bank recapitalisation. There has been some progress but apart from demands by the so-called bailout Troika, there have been no significant reforms and there is unlikely to be as Gilmore, the junior partner in the governing coalition and leader of the Labour Party, will not challenge public sector trade unions that have made common cause with counterparts in the professional trade unions (medical consultants, lawyers etc.) in resisting change. The following is a response to a question on the Irish Economy blog on when the euro crisis will end? Next February, it will be 6 years since HSBC announced multibillion dollar losses on US subprime mortgages. There is at least a decade of angst and turmoil ahead - - despite a likely improvement from the current situation in coming years. Global growth may improve but from recent evidence, the Chinese will be cautious about the switch of the balance from investment to consumer spending. Stagnant US middle class incomes will continue and there will be no house equity to boost consumer spending. The big successful companies employ a fraction of their counterparts in the past. General Motors had over 618,000 employed in the US in 1979 - - in well-paid jobs; today, General Electric employs 133,000 and Apple 47,000. The French newspaper ‘Ouest-France’ this week chided the government for presenting an unrealistic outlook of times ahead. The credit boom masked the reality of a growth crisis in Europe. The turmoil will be in response to inevitable change because countries will have to adjust to paying their way without the aid of fast rising debt. The insiders will fight to retain their priviliges but at some point in a country like Ireland, the collective power of the sans-culottes will get the attention of political leaders. It happened in 1979 after the Government cravenly gave in to farmer demands to rescind a planned tax levy. PAYE income tax reform followed one of the biggest street protests in the history of the State. There is a reason why there is seldom serious attention given to the issue of job creation. Politicians tend to keep their fingers crossed with the next election in mind. Nevertheless, the speed in which François Hollande dropped his growth agenda is surprising. However, a country that is close to the end of the road soon finds that the cliff beckons. The Irish Economy blog has a thread on a comment article today in the Financial Times by two Spanish academics, who call on the prime minister to take radical action. The peseta wasn't able to provide magic solutions and the unemployment rate was 21% in 1997. Excluding construction, Ireland had no real growth in the past decade; Italy only managed 3% in 2001/2010 - - 0.3% per year; US 16% (worst since 1945); UK 15%; France 12%; Germany and Japan 8%. Japan had a per capita annual GDP of 1.6%; US 0.7%; France 0.6% and Germany 0.8%. In early 2009, I compared the broken governance systems in Japan and Ireland even though both countries have got new governments after long-dominant crony parties were turfed out of office, little has changed. There is little appetite for change in Ireland despite the crash. A culture changes very slowly and issues such as reform are not a priority in a conservative society. Process is boring and cannot match the level of interest when there are perceived nefarious foreign forces to blame. We love to talk but the record of running things is poor. The level of transparency is also very poor; the available useful data on public spending is primitive and conflict of interest remains a strange concept in Ireland. RTÉ, Ireland's State broadcaster, sees no problem in board members pitching for work to former colleagues: "It would not be in the interest of any public broadcaster, nor the public, for independent producers of experience and skill . . . to be either barred from board service or, if appointed to a board, to be barred from seeking to maintain their business and livelihood by being disallowed from competing for programme commissions." When it was disclosed in 2010 by The Irish Independent that the wife of Eamonn Gilmore, Labour Party leader, had sold a two-and-a-half acre site in Galway for €525,000 to the Department of Education, a LP spokesperson said: "She is a private citizen and it is her money, not his." The planning tribunal wound up after 15 years, lawyers became multimillionaires and the corrupt land-rezoning system remains untouched. Changing the power balance in the Oireachtas would help over coming decades but the main interest of members will remain at the parish-pump level for the foreseeable future. Research resources have been improved in recent years, TDs have been given additional staff (more opportunities for family jobs) but there is no evidence of improvement in teh standard of output. 37,397 Parliamentary Questions (PQs) were tabled in 2011 and Dáil Éireann registered second highest out of 18 Parliaments. The Irish figure is approximately three times the average number of questions tabled of 12,515. As for civil servants standing up to ministers, again unlikely to happen and there are specialists in the area of science in enterprise agencies and in the Enterprise Department, but it doesn't seem to matter. The enterprise agency heads when they speak in public, it's usually babble supporting the official line. How likely is it in UCD that an insider would even question a pet project of a professor that is wasting public funds? Look no further than the public science budget over 10 years of €23bn to wonder about governance: Oireachtas (houses of parliament) committee members not interested because it's over their heads; university presidents vying for funds but showing no interest in value for money issues; State agencies supporting ministerial delusion that Ireland could clone a Silicon Valley where so many others have failed; tech companies and IBEC welcoming lavish funds and captured journalists dazzled by stories of Facebook, Apple etc. Irish Economy 2012: Are house prices bouncing back or just an illusion for delsuionists? Irish Economy 2012: Daft.ie reports today that while the average asking price in the capital did fall in Q2 (by 1.2%), taking the first half of the year as a whole, list prices in Dublin fell by less than 1%, compared with a fall of 10% in the second half of 2011. The following are 2 posts to a thread on Irish house prices on the Irish economy blog. 2) During the bubble, Irish land became the most expensive in Europe partly because of the very low supply. Farmers on CAP welfare were able to supplement their income by working in construction etc. while via the IFA, the farmers were also able to arrange a shakedown of the State in respect of land for roadbuilding, grabbing almost 25% of the national roadbuilding budget. In the current market, mortgages approvals were at about a 1968 year low in the first quarter of 2012 while the evidence from auctions shows that cash buyers can get discounts of 25% or more from what are regarded as current official price levels. What was typical of our ’slightly constitutional’ governance system was a tribunal sitting all through the bubble period, investigating planning corruption, while local poltroons continued to create an artificial scarcity of land for development, in a country that was 4% urbanised. Has anything really changed? — a corrupt system eventually becomes endemic and every development spawned Sunday morning craw-thumpers, whited sepulchres and many more, seeking to squeeze what they could from the system. The strategic planning guidelines constitute a mandate for continuing urban sprawl which will create an ever expanding metropolis around Dublin at lower density than any comparable urban area in Europe, DKM Economic Consultants warns in its report. According to Colm McCarthy, of Davy Kelleher McCarthy, the predicted number of new dwellings will require that development occurs over an area more than twice the size contained within the M25 around London, which has a population of eight million. He maintains that suburban development at six units to the acre would accommodate the required 165,000 dwellings in an area of 118 sq kilometers, or seven miles square. “The process of urban sprawl around Dublin has already spread throughout north and mid Leinster, beyond even the large area envisaged by the Strategic Planning Guidelines”, he warns. Due to speak at the Irish Homes Builders’ Association convention in Edinburgh this morning, Mr. McCarthy suggests an alternative policy by aggressively zoning and servicing all undeveloped land within ten miles of the city centre for housing and mixed-use development. The demands of the farmers were met - - nothing strange in that. The amount the State was forced to pay out for land compensation was described as "disturbing" by the head of the National Roads Authority in 2006. It accounted for 23% of the cost of roads projects in Ireland, but just 12% in England, 10% in Denmark, 9.4% in Greece and 1% in Iceland. A further 2% of the €18.5bn provided in the Government's Transport 21 for road building over the decade was go to archaeologists. RTÉ’s Prime Time programme in November 2007 disclosed statistics about the involvement of elected representatives in the land development and property business. Prime Time found that in Clare, declarations of interest showed that 97% of elected members have no beneficial interest even in their family home. In ten counties, two-thirds or more of the councillors have not declared an interest in the family home. Economist Jerome Casey, who was editor of the 'Building Industry Bulletin' in a report in 2003, said that site costs accounted for 42.5% of the cost of a house nationwide. Casey said that typically in the mid 1990s, Durkan Brothers sold apartments off O'Connell Street for £35,000 to £40,000 (€44,440 to €50,790) for which the site cost was £5,000. A decade later, both the Irish Council for Social Housing and private house builders were reporting city house site costs at up to 50% of the house price. Outside the cities, site costs amounted to up to 40% of the house price. For the country as a whole, site costs in 2003 were about 42.5% of the house price, an increase of almost 30 percentage points on the pre-boom position. In Dublin that increased to 50%. In the US land accounted for 20% of the total cost of a house. In Denmark the figure is similar while in Portugal the land factor drops to 15%. The Irish Times reported in March 2012 that the State spent €30m goodwill payments to landowners for not obstructing agricultural land sales for road projects between 2007 and 2011. Payments for not obstructing - - shakedown is surely an apt term. A so-called goodwill payment of €5,000 for every acre of agricultural land sold for road projects was made as part of a deal to ensure farmers co-operated with compulsory land purchases under the second National Development Plan (NDP). An estimated €30m was added to the €1.4bn cost to the State for land purchase under the second NDP because of the goodwill payment. The fee applied to the purchase of approximately 6,000 acres of land. An article by Derek Scally, German correspondent of The Irish Times, on Chancellor Merkel, was published on June 02, 2012. It's ironic that it was France that pushed Germany to support the creation of the euro as a quid pro quo for support for German unification but despite the euro in existence since 1999, it has not balanced its budget in any year since 1974 and its national debt to GDP (gross domestic product) ratio rose from 22% in 1975 to 90% in 2010. In addition, it has had a trade deficit in every year of the last decade. France in 2011 had a deficit of €70bn compared with Germany's surplus of €158bn - - only 12% of the latter related to the Eurozone and two-thirds was ex-EU27. In effect, Europe would have been poorer without the global success of Germany's world class companies. "Did I mention that -- after unification -- the Germans tried (against their will, they had to) more than a decade of massive fiscal stimulus, and subsidization of consumption, starting with well under full employment, and yet with mediocre results? That wasn't long ago," Tyler Cowen, a US economist, commented in 2010. "And yet somehow it is a mystery, or a strange annal in some long book of Dogmengeschichte, that the Germans are not more interested in Keynesian economics." Despite massive public spending since 1991, GDP per capita in the former East Germany is about 70% of the level in the former Federal Republic. Convergence within Germany or in the Eurozone, is a very long process. Even if the weakest German regions were to grow a steady 4 percentage points faster than the strongest regions, it would them take more than 45 years to catch up. The sick man of Europe! The benefits of reforms with flexible wage agreements were seen during the recession and up to 1.5m people were kept at work with the help of public subsidies. It's not all roses and in the services sector, there are too many on low pay dependent on public top-ups. In France, President Chirac ventured into the minefield of reform in 1995 but he soon threw in the towel. The UK's gross debt/GDP ratio is expected to be 88% this year compared with 145% in 1956. Sir Samuel Brittan, veteran economics columnist of The Financial Times has commented: "The second world war was financed in the UK with a 0.5% bank rate. Why should it be more alarming for governments to get into debt to put people into useful work satisfying human needs than to borrow for guns and tanks whose only aim is to kill other human beings?" Governments tend to do a lot more these days and a French male typically retires at 59 - say entering the workforce at 24 and living until 80 - - - 45 years of dependency. The French have a social security tax on wages of an average 40% (30% paid by the employer) and no country can now afford cradle to grave 'socialism' - - and in China, unlike France, most people have to purchase health services. In countries such as France, Spain and Ireland, some groups have disproportionate benefits while young workers maybe lucky to get temporary work. In Ireland, the majority of private sector workers have no occupational pension while public sector workers have pay premia; guaranteed employment and a pensions scheme linked with earnings. It all adds up and in 2011, the public pay and pensions bill (ex-local authorities) was over €17bn -- compared with €16bn in 2006 -- the peak year of the boom - - and €10bn in 2001. The social protection budget was €8bn in 2001 and €21bn in 2011. There is need for reform because the global market is no longer Western Europe, US, Canada and Japan. What is often ignored in Europe is that the growth crisis is not new and pre-dates the euro. Until the bitter truth is faced, the remedies will not match the challenge. Eurozone countries like Italy, Spain and Greece have had trade deficits with Germany since at least 1980 -- 20 years before the euro launch. The International Monetary Fund (IMF) says the euro is a continuation rather than a structural break and the Fund's statistics show that since 1999, Germany's trade surplus with the rest of the world has grown faster than its surplus with the other Eurozone countries -- and faster still with European nations that have not adopted the euro. Marco Annunziata, an Italian economist, says that implausible as it sounds, Italian voters have put up with an average youth unemployment rate of 30% for the last 40 years; Spanish voters with a rate of 32%. Italy experienced “strong” economic growth during 1994-2000, with GDP rising at an annual average of 2%. During this boom period, the youth unemployment rate still averaged 33%. In other words, one young person in three was unemployed when the economy was at its strongest. The rate never dropped below 20%. Spain’s economy grew at an average of 3.6% between 1995 and 2007. During this impressive run, the youth unemployment rate averaged 28%; it was below 20% for just three years, with a “best performance” of 18% in 2006. In 1994, Spain's total jobless rate was over 24% in 1994, 21% in 1997 and 8% in 2007 and back to 24% in 2012. Italy's jobless rate was higher in 1996 than it is now. Italy's economy grew at an annual rate of 0.3% in the last decade. Ex-property booms in Spain and Ireland and a credit boom in Greece, there would have been no growth. Much of UK growth was an illusion powered by public spending and the financial services boom. Ireland's jobs in the internationally traded goods and services are below the 1999 level. In the period 2000-2007 -- the bubble years -- no jobs were added as employment grew in other sectors by 430,000. Indigenous trading firms typically export about 35% of output and the sector added 10,000 jobs but the FDI sector lost 10,000 net jobs. Reform is a dirty word in many countries in Europe because vested interests rightly fear change. The World Bank's 'Doing Business 2012' rankings of the ease of doing business in 183 countries puts Greece at 100, behind Yemen and Vietnam and just ahead of Papua New Guinea. This compares with Italy at 87, just behind the former communist ruled Mongolia; Spain is at 44; Portugal at 30 and Ireland at 10. There can be a case for long-term investment in current times. However, EU funds have supported significant improvements already in Greece, Ireland, Spain and Portugal. Despite superior infrastructure, inward FDI as a percentage of Greece’s GDP averaged only about 1% from 2004 through 2010, compared with an average of 8.1% in Bulgaria, Turkey and Romania. A solution will have to be a two-way street. Shane Ross TD, a non-party right-wing member of the Dáil (Irish Parliament) has taken a brave step that is consistent with the rare evidence of courage among Irish legislators. He has come off the fence on the May 31, 2012 referendum on the EU's Fiscal Treaty. Ross advocates a no and a yes vote. He said in yesterday's Sunday Independent: "Many of us, passionately pro-European, want to support the European project. We want to vote 'Yes'. We cannot because we are being compelled to vote in a twilight zone." Stephen Collins, political editor of 'The Irish Times' wrote in April 2011 in reference to people such as Shane Ross who were cheerleaders of the most reckless bankers of the bubble: FitzPatrick of Anglo Irish Bank and Fingleton of Irish Nationwide Building Society: "It is probably no accident that some of the cheerleaders of the boom have now turned into leading prophets of doom. The same reckless, gambling instinct that fuelled admiration for Seán Fitzpatrick also underpins the 'burn the bondholders and damn the consequences' philosophy." "I sometimes had to act against the preconceived opinions and first impressions of my constituents...I value solid popularity - - the esteem of good men for good actions. I despise the bubble popularity that is won without merit and lost without crime" -- Thomas Hart Benton, US senator of Missouri, 1850. We are in an age where telling the truth can evoke outrage and it's reported that the Facebook page of Christine Lagarde, IMF chief, was bombarded with 10,000 messages in response to daring to point to extensive tax evasion in Greece. In Ireland, it's rare for politicians to tell home truths to the public. Public pandering is the default route but is often against the public interest. Senator Benton took an unpopular stand in his home state saying the "incurability of the evil is the greatest objection to the extension of slavery" to new federal states. A colleague on one occasion pulled a gun on him on the floor of the US Senate. "You choose a member, indeed; but when you have chosen him, he is not a member of Bristol, but he is a member of Parliament. If the local constituent should have an interest or should form a hasty opinion, evidently opposite to the real good of the rest of the community, the member for that place ought to be as far, as any other, from any endeavour to give it effect." "In a study done last year, the OECD described government-run Greek hospitals as deeply corrupt. It concluded that we could save 30 percent of the costs, which is enormous. The hospitals generated a deficit of €7 billion last year. Imagine what an unbelievably large amount of money we could save by simply introducing computers into hospitals. Until now, there has been far too little control over the purchasing of medications and equipment. In Germany, a stent for heart operations costs about €500. In Greece it costs €2,000 to €2,500. The fault lies with corruption" - - George Papandreou, Greek prime minister, Feb 2010. The Irish Department of Finance has published updated projections for the public finances. The current deficit reduction plan rests on relatively small additional budgetary adjustments (€7.8bn) through 2013-2015 compared with the €25.0bn of expenditure cuts and tax rises since July 2008. However, the plan also rests on a robust pick-up in the nominal growth of GDP (gross domestic product) to 3-4% by 2013. Should Irish nominal GDP growth disappoint by just 1 percentage point (pp) per annum, the ratio of gross government debt to GDP could be 10pp higher than expected by 2015. Last month, the Department of Finance said that while taxation receipts in 2012 are projected to be just above 2004 levels, the gross voted expenditure of Government Departments and Offices in 2012, at an estimated €56bn, is projected to be 37% above the level it was in 2004, despite the very significant adjustments to both revenues and expenditure since mid-2008. The Department said [pdf] that while the gap between the State’s revenues and expenditure is clearly on a downward trajectory, it remains at an elevated level and it will need to continue to be addressed by economic and fiscal policy over the coming years. A report from Davy Stockbrokers [pdf] published on Thursday says the important figure is "net debt," after allowing for assets held by the government, such as the pension fund, and Ireland's favourable net position is often ignored. Our current Davy forecast is for the debt/GDP ratio to rise to 122% in 2013, a little higher than the official projections for debt to peak at 120%. Prof John McHale of NUI Galway and chairman of the Irish fiscal council, which is an independent body which issues reports on government budgetary policy. On the Irish Economy blog, Prof McHale presented a scenario on the outlook to 2020 for the Irish economy. I think it would be wiser to focus on real world scenarios rather than metrics for the EU and the markets. This is comparable with an Excel template for a business plan and the tweaking can produce the desired result but it may not be a realistic one. The Department of Finance says in its Stability Update last month that while taxation receipts in 2012 are projected to be just above 2004 levels, the gross voted expenditure of Government Departments and Offices in 2012, at an estimated €56bn, "is projected to be 37% above the level it was in 2004, despite the very significant adjustments to both revenues and expenditure since mid-2008." The DOF projects a fall of €5bn in gross voted expenditure between 2012 and 2015: from where will these cuts come from? Minister Howlin has touted cuts in the central government paybill by 2015 (note pensions excluded). If 2006 is the benchmark and public staff pensions are included, there will be ZERO savings compared with 2006, the peak year of the boom. Conall Mac Coille of Davy says a 1% annual shortfall in the nominal GDP to 2015 would add 10% to the gross debt/GDP ratio. You assume spending rising at half the rate of nominal GDP but there are no reforms to suggest that this outcome is credible. There is no obvious jobs engine and unemployment will remain very high for years; how realistic is annual capital expenditure of just €3bn in the remainder of the decade? There is a growing young population coupled an expanding dependent population. In an internal debate, GNP growth and the debt/GNP ratio should be used even though GNP also reflects MNC accounting manipulations. We will have 8 years of cuts by the time the ‘fiscal consolidation’ works! A 40% cut in the public procurement budget — legal firms, DPP contractors, IT contractors, doctors, health insurance payments, severance payments and in respect of pay, that percentage would apply above a threshold for current and former civil servants — should have been introduced in the first year of the crisis. That would have required ministers in giving up scandalous bonanzas — too much to expect. Was life that bad in the late 1990s that we could not use it as a base? During the bubble, the outsize gains in private sector areas were in business sectors where public contracts were available. The State pays half a billion euros annually to lawyers. Does it have to? Is there such a market demand to justify the current rates? We need to get real about what can be afforded in order to build a sustainable economy.